Creating a great marketing campaign may sometimes feel like brain surgery. Don’t worry; Bookyourdata.com offers the tools you need to reach out to neurosurgeons and neurologists. Our neurologist contact list has all of the information you need: emails, numbers, and more! Sizzle the synapses of a brilliant group of neurologists and neurosurgeons by marketing your product, pharmaceutical, service, or journal to them with this targeted neurologist email list. Introduce your cerebral idea or your physical product to them easily by connecting with them over email, mail, or phone. 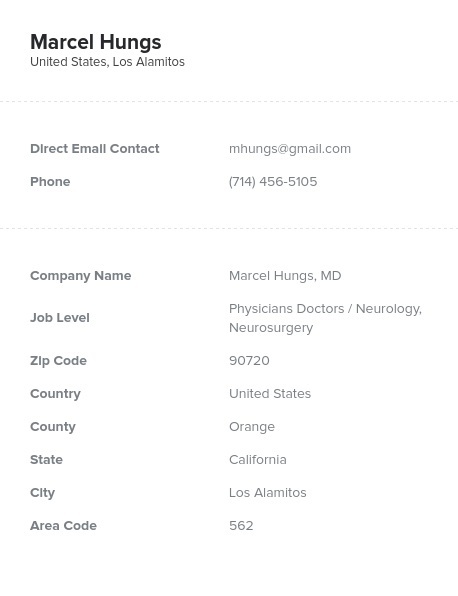 This organized neurologist mailing list from Bookyourdata.com has the full, premium contact information of the neurology specialists at numerous hospitals and medical institutions. Purchase this affordable list of sales leads, integrate it into your CRM, and start communicating with this uniquely knowledgeable group. We can help you get on the same wavelength! Neurologists and neurosurgeons study the nervous system, which includes the brain, spinal cord, and various neurons spread out throughout the body. In this neurology email list, you can find highly qualified brain surgeons and neural specialists, all in the business of helping their patients. Common illnesses they deal with include strokes, Alzheimer's disease, tumors, and spinal issues. They deal with both common illnesses and unusual nerve problems and work hard to make sure their patients get the best care possible. Keep this information in the forefront of your mind as you pull this accurate information for use. Download this list of verified email leads, integrate it into a CRM, and start connecting with these masterminds. Contact neurologists and neurosurgeons by buying this premium, ready-to-download contact list today!